Notes: Partington Station was the second station so named and was located on the Cheshire Lines Committee (CLC) Glazebrook to Stockport Tiviot Dale Line. The CLC was a joint company that was owned by the Great Northern Railway (GNR), the Manchester Sheffield & Lincolnshire Railway (MSLR) and the Midland Railway (MR). 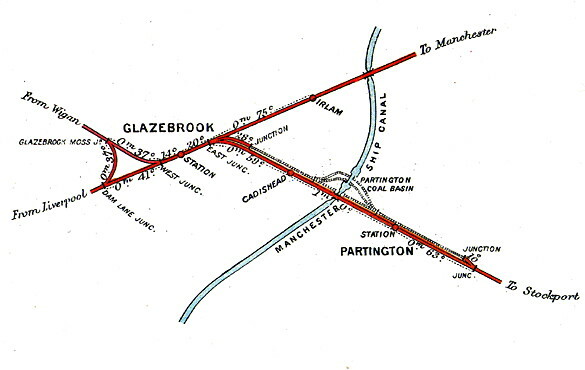 In the 1890s the building of the Manchester Ship Canal necessitated the diversion and raising up of a number of railway lines including the Glazebrook to Stockport Tiviot Dale line. The line had to be built up to a height that would allow sea going vessels to pass underneath and so a deviation was constructed just to the south of the original line which included a large single span girder bridge and a new station for Partington. 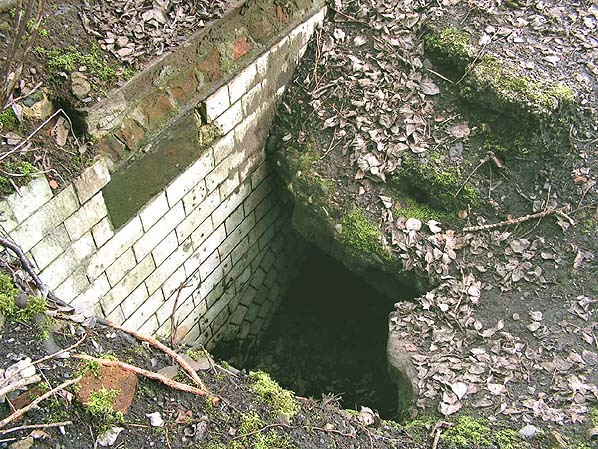 For a few weeks in 1893 both lines were in use but eventually the original course of the line was split into two by the excavation of the Manchester Ship Canal. 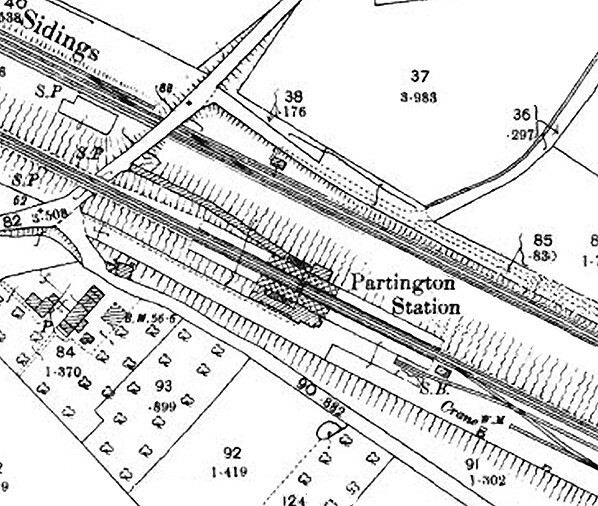 Partington’s second station opened on the 29th of May 1893 and the original station was closed. The station was situated on an embankment. The line was double track the station was provided with two platforms. The main facilities were on the westbound platform and consisted of a brick built building which had a single storey booking hall and waiting rooms co-joined with a two storey station masters house. The building was in the style of other CLC main line intermediate stations that had been built in the early 1870s. Access was via a sloping driveway that led up from the Manchester Road. A subway linked through to the eastbound platform which had a single storey brick built waiting room. Both platforms at Partington were provided with canopies. A CLC type CL1a signal box with 26 levers was located at the southeastern end of the westbound platform. and London St Pancras also passed through the station. Many other express services also passed through along with a steady stream of goods services. The December 1895 timetable showed Partington as having only five eastbound departures and three westbound departures on weekdays as shown in the table below. On Sundays there were three eastbound and two westbound trains. In 1897 the MSLR changed its name to the Great Central Railway (GCR). The July 1922 timetable showed a somewhat improved passenger service at Partington with regards to westbound weekday services there being seven as shown in the table below. The eastbound departures remained at five (also shown below) but there was no Sunday service. At the grouping of 1923 the CLC remained independent but its owning companies became the London & North Eastern Railway (LNER) with two thirds of the shares and the London Midland Scottish Railway (LMS) with one third. The local passenger services at Partington were hauled by LNER locomotives after 1923. The LMS Summer timetable for 1932 showed only four westbound services Monday to Friday and only three on a Saturday. Eastbound there were also four. On Sundays there was one train in each direction. On the 1st of January 1948 the line became part of the nationalised British Railways (London Midland Region). The 1949 Summer timetable showed Partington as having six eastbound and five westbound services Monday to Friday with retimed and services on Saturdays as shown in the table below. There were no Sunday services. Although the line remained busy throughout the 1950s the passenger service at Partington remained broadly similar to how it had been in 1949. By the 1950 the station had also lost its canopies. and white washed bricks which greatly improved what had by the early 1960s become a run down station.The Curren children became a feature of the station during this period using it and the nearby goods yard as their playground. This was with the blessing of railway staff including Mr Dawson. Shortly after Mr Dawson retired he travelled through Partington Station on his way to Northenden to visit his Grandaughter. Led by Anne Marrie Curran who had become particularly fond of Mr Dawson the Curran Children lined up on the platform and ran alongside the train carrying Mr Dawson as it arrived. Quite a scene was caused with passengers looking out of the train to see what was going on. Mr Dawson was delighted with the reception and even the station porter came over to shake his hand. The Re-shaping of Britain’s Railways Report of 1963, which became known as the ‘Beeching Report’ recommended that passenger services be withdrawn from Partington. The Summer 1962 timetable showed only four eastbound and five westbound departures Monday to Friday as shown in the table below. A train from Wigan Central terminated at Partington at 7.01am and there was no Sunday service. The service was withdrawn on 30 November 1964 and Partington station closed completely. After closure the station became the haunt of un-desirable individuals and as a result of this the Curran family moved out of the station house in 1966. Dereliction set in and eventually the station building was demolished. chemical plant) through to Glazebrook. The line remained in use for goods services until 29 July 1982 but it is known that on Saturday 5 January 1974 the Midlander Railtour from Liverpool Lime Street to Derby passed through Partington station. 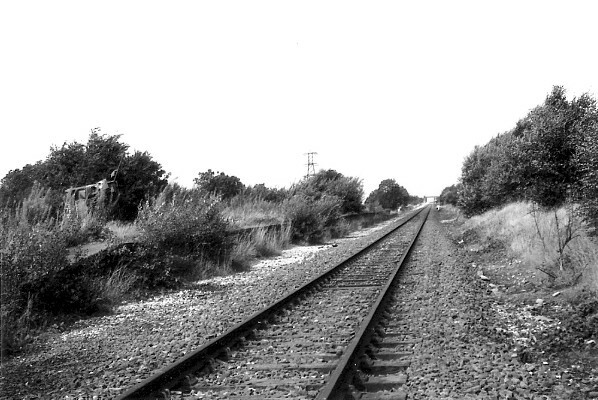 On 3 August 1982 the points at Glazebrook East Junction were clipped out of use and formal closure of the line through Partington station came on 4 September 1983. It was lifted shortly after. Chemical trains continued to run from Skelton Junction to the chemical works at Partington until 1994. Laterly a train of oil tanks ran from Partington to Baglan Bay in South Wales. 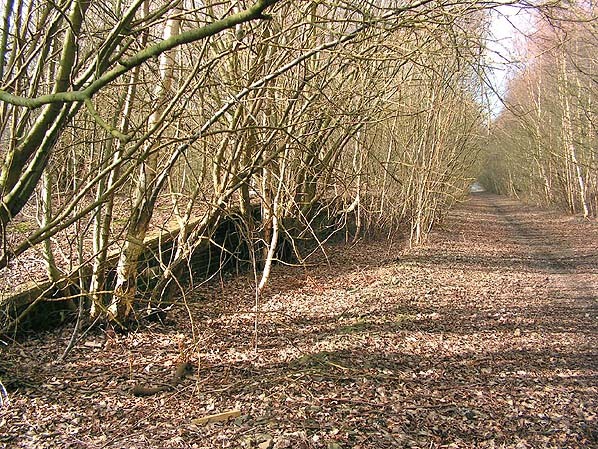 The track between the chemical works and Skelton Junction remained in situ in 2012. Although the stations buildings were demolished after closure the Liverpool direction platform and sections of the Stockport platform remained extant in 2011. Of particular interest is the glazed brick subway which although partially buried could still be seen. 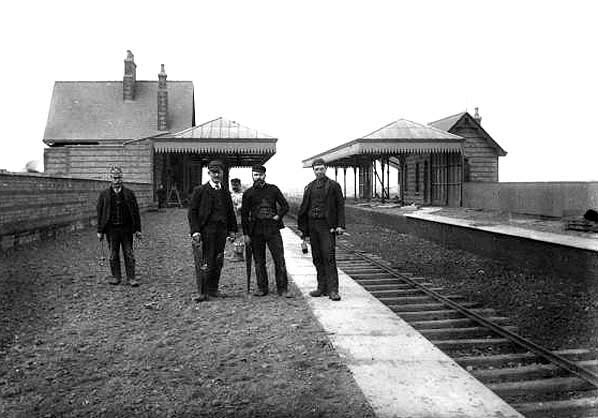 The new station at Partington under construction in 1891. The track seen running through the station was a temporary contractors line and would be replaced by two tracks using a more substantial type of rail and sleepers. The original alignment was still in place in 1961. The original alignment has an underbridge under the B5158 while the deviation had an overbridge to give the line sufficient height to bridge the Manchester Ship Canal. Partington shown on an 1899 map. 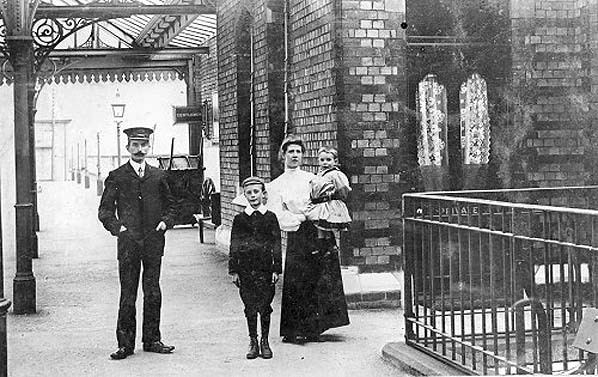 The Partington stationmaster and his family pose for a picture on the Liverpool direction platform at Partington in the early years of the 20th Century. The Partington station Stockport direction platform as seen looking south-east in August 1952 from a passing train. 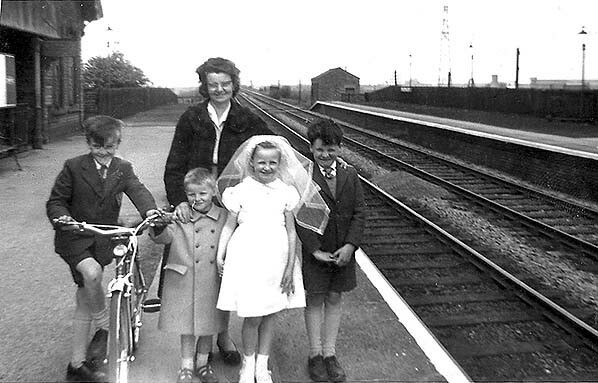 The Curran Family who lived in Partington Station house from 1960 to 1966 pose on the Liverpool direction platform at Partington station at the time of Anne Marrie Curran's first holy communion. The view shows the line heading off towards the bridge over the Manchester Ship Canal and onwards to Liverpool. Despite the fact that only a few passenger trains called at the station at this time it is well kept. Mr Patrick Curran who was based at Manchester Central Station spent his own time improving the gardens and approaches to Partington station. 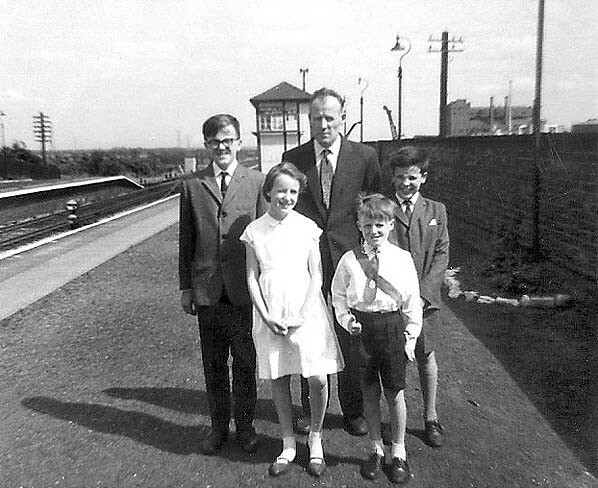 Patrick Curran and his children who lived in Partington Station house from 1960 to 1966 pose for the camera on the Liverpool direction platform of the station in the early 1960s. The view is looking towards Stockport and at the end of the platform can be seen Partington signalbox. 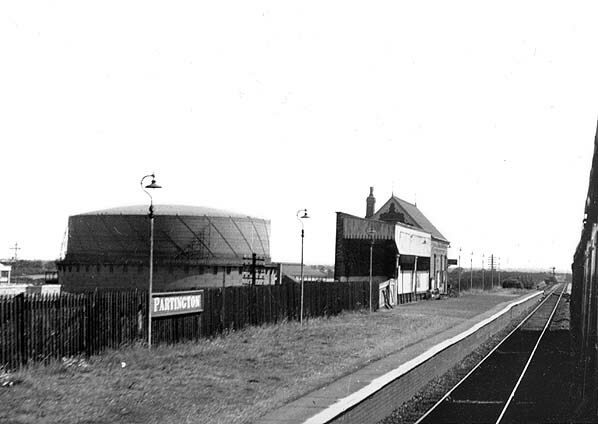 Looking south-east at Partington station in 1973. Looking north-west at Partington station on 2 September 1983. 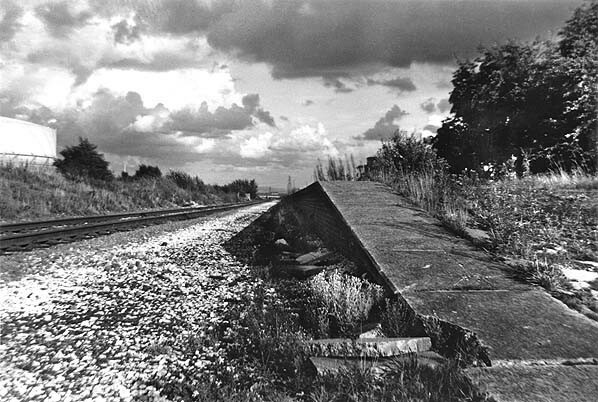 The Stockport direction platform which had been to the right had been demolished. The Liverpool direction platform is clearly seen to the left. The line itself had been singled since May 1970 and had seen no regular traffic since 29 July 1982 and it had been unusable since 3 August 1982.